Mathias Langan, Penelope Byrne and their five children immigrated to New York City in the 1890s. Mathias returned to Ireland sometime between 1911 and his death in Ballinrobe. He died in Ballinrobe, age 80, in 1920. This photo was originally in the possession of Margaret (Maggie) Walsh Petersen, the grandaughter of Mathias Langan, who gave it to Maria Lahiff Pedulla. Mathias Langan, the son of Mathias Langan and Margaret _____ , was born in June circa 1841 in County Mayo, Ireland. When Mathias Langan married Penelope Byrne in 1865, his father was listed as "Mathias Langan, poor tenant". It can be shown that Mathias Langan had a close relationship to Patrick Langan, who is known to have been the son of Margaret Langan. Margaret, Pat, and Mathias followed each other in the Griffith listings at #10 Creagh Road, town of Ballinrobe. His birth was given on the 1900 census in New York City as June 1841.Censuses are not always reliable for this type of information. On this census the months and years of his two children were correct. However, the month and year for his wife, Nappy Byrne, was not right. The marriage record of Mathias Langan and Penelope Byrne in 1865 listed him as 21 years old. This would suggest a birth year of 1844. On the ship manifest, at the time of his immigration into the US in 1892, his age was given as 49, which would suggest a birth year of 1843. I do not know exactly where Mathias Langan was born. However, he was most likley born in County Mayo. Langan is a Mayo name and all the records connected with him in Ireland were found in County Mayo in the parishes of Shrule and Ballinrobe. Another concentration of Langans was in the parish of Cong. Cong parish is about seven miles south of Ballinrobe and directly to the west of Shrule parish. Mathew (sic) Langan, age 21, bachelor, profession, labourer, residence at the time of marriage, Ballinrobe, father, Mathais Langan, poor tenant married Penelope Berren (sic), age 22, spinster, profession, labourer, residence at time of marriage, Tubbersharre, daughter of Michael Berrin(sic), poor tenant on June I, 1865 in the Roman Catholic Chapel of Shrule, District of Cong, Union of Ballinrobe, County of Mayo, Ireland. The witnesses were Thomas Berren (sic) and Saragh Burke. All four of them signed with their "mark". Penelope was born in 1836, which means she was 29, not 22. Tubbersharre was the name of a holy well located near the townland of Mochara in Shrule Parish. Thomas Berrin was Penelope's brother. I do not know who Saragh Burke was. There were no other Burkes associated with either the Byrnes or the Langans. Pat Langan was born on May 5, 1866, at Creagh Road, Ballinrobe to Mathias Langan, labourer, and Nappy Langan, formerly, Byrne. The birth was registered on June 2, 1866 in the District of Ballinrobe, Union of Ballinrobe by his mother, Nappy Langan. Patrick Langan, the son of Mathias Langan and Nappy Byrne, was baptized on March 15, 1866 in St Mary's Church, Ballinrobe, sponsors: Winny Byrne and Martin Farrecher. Winny Byrne was Penelope Byrne's sister. The parish records show a close connection between Martin Faragher and Mathias Langan. For more infromation on Martin Farragher, go to Langan Relations now or at the bottom of the page. 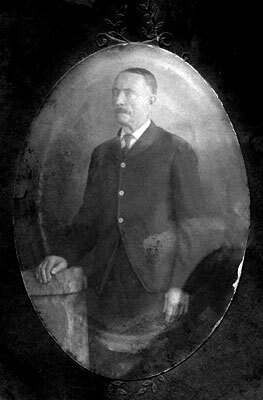 Martin Langan born November 9, 1872 in Mochara, to Mathias Langan, farmer, and Nappy Byrne. The birth was registered on November 24, 1872 in the District of Cong, Union of Ballinrobe by his mother, Nappy Byrne. The South Mayo Family Research Center, Main Street, Ballinrobe, County Mayo, Ireland researched the Shrule records for me and made the following report on Martin Langan's baptism. "No corresponding church record of baptism found in Mayo." Margaret Langan, was born November 6, 1875 in Mohara (sic) to Mathias Langan, farmer, and Nappy Langan, formerly, Byrne. The birth was registered in the District of Cong, Union of Ballinrobe by Patrick Langan of Mohara (sic), who signed with an "X" and listed himself as "present at the birth". I cannot access the original records. "Margt Langan from Tubbersharive was baptised on the 22nd of March, 1875 . The parents are recorded as "Martin" Langan and "Margt" Byrne"
Margaret Langan, baptised 22 March 1875, sponsors: Patrick Lanagan (sic) and Mary Ellen Gibbons. Patrick "Lanagan" (Langan) was Mathias's brother. I do not know who Mary Ellen Gibbons was. Gibbons is not a name that occurs in any of the other records connected with the Langans. On his application for naturalization, Joseph Walsh says that his wife, Margaret Langan, was born in Mayo, Ireland on September 21, 1875. On her death certificate, Maggie Langan's date of birth was given as November 5, 1875. "Martin" Langan and "Margt" Byrne on the baptismal record are probably clerical errors either in the original records or the later transcription. The combination of the child's name, the year of birth, the last names (Langan and Byrne) and the place, Tubbersharive make it quite certain that this is the correct record for the baptism of Margaret the daughter of Mathias Langan and Nappy Byrne. On many of the civil records there is a notation that the person reporting the event signed with his or her "X". It is clear from looking at the records that in 99% of the cases the "X" was made by the clerk. All the "X's" are very small and neatly written between the first and last names. In reporting the birth of Margaret Langan, Patrick Langan made a big bold "X" that was clearly his own mark. James Langan was born on April 14, 1877, at Glebe Street, Ballinrobe, to Mathias Langan, labourer, and Nappy Langan, formerly, Byrne. The birth of James Langan was registered in the district of Ballinrobe, Union of Ballinrobe on April 28, 1877 by Patrick Langan of Ballinrobe, who was listed as present at the birth. James Langan, the son of Mathias and Penelopa Langan, was baptized on April 1, 1877 in Ballinrobe parish, sponsors: Martin Faragher and Ellen Faragher. Ellen Curren Farragher and Martin Farragher were married to one another. Bridget Langan was born on November 9, 1879 at Glebe Street Ballinrobe to Mathias Langan, labourer, and Nappy Langan, formerly, Byrne. The birth was recorded in the District of Ballinrobe, Union of Ballinrobe on November 28, 1879 by her father, Mathias Langan. Bridget Langan was baptized on November 19, 1879 in Ballinrobe parish, the daughter of Mathias and Penelopa Langan. The sponsors were Pat Langan and Bridget Feerick. Bridget Feerick was Bridget Langan Feerick, the sister of Mathias Langan. The six-year break between Pat and Martin is quite large for the times. The standard rate of reproduction in Ireland in the mid to late 1800s was one child every two years; room for at least two or three more children. There were no other children listed for Mathias and Nappy in either the civil or the parish records in Ballinrobe or the civil records in Schrule. Mathias and Penelope simply did not have other children. Penelope had a number of miscarriages or stillbirths, but no live births. Mathias may have been an itinerant worker and been gone for long periods of time. After their own crops were planted, it was common for Mayo men to leave Ireland for the summer months to work on farms in Scotland and England. They would walk from where ever they lived to Westport and take the boat. In general, children were baptized within a few days of the birth. The civil registration was supposed to be done within 90 days of the birth. However, many births were recorded whenever someone got around to going and reporting them. If the time limitation was up, a birthday was invented. Mathias and Penelope were not literate. All of their children were. Mathias Langan was living in Ballinrobe at the time of his marriage to Penelope Byrne in 1865. Mathias and Penelope were living on Creagh Road, Ballinrobe at the time of the birth of Pat in 1866. Since Mathias was not listed in the tax records as a head of household, they must have been living with his mother, Margaret, who was listed as a head of household on Creagh Road, Ballinrobe, in the Grifffith at that time. They were living in the village of Mochara in Shrule Parish from at least the birth of Martin in 1872 until the birth of Maggie in 1875 . Since Mathias Langan was not listed as a head of household in the tax records between 1871 and 1875 (in either Ballinrobe or Mochara) they must have been living with Penelope's mother, Penelope (Nappy) Naughton Byrne who was listed in the Griffith Valuation in Mochara from 1856 to 1877. The Griffith lists heads of house hold only. Frequently widows were listed as the "head of household" in a household that included their grown children and grandchildren. The South Mayo Family Research Center, who did a report for me on the Byrne family in Shrule parish, did not give me places of birth for the children of Thomas Byrne, the son of Penelope Naughton Byrne. The only indication they gave me of his "address" was the death record of his daughter, Mary in 1881 which listed Mochara. Since there is no seperate listing in the Griffith for Thomas Byrne, and since Thomas Byrne (acording to the Griffith) took over the property of Penelope Naughton Byrne, it is highly likely that he was also a part of the household of Nappy Byrne listed in the Griffith in Mochara from 1856 to 1877. It was quite a house full: Nappy Naughton Byrne, Mathias Langan, Penelope Byrne Langan, their children (Patrick, Martin, and Maggie), Thomas Byrne, his wife, and his two children. These living arrangements were not unusual for the time and place. The Langans were back in Ballinrobe by at least April 1877. They were living on Glebe Street, Ballinrobe at least from the birth of James in April 1877 until the birth of Bridget in 1879. The Giffith Tax Ledger that covers the years 1872-1880 for the town of Ballinrobe, shows that Mathias Langan was listed as the head of house hold at 27c Friar's Quarters, (in a house whose tax was valued at 10 shillings) in 1878. I do not know exactly when the valuation was done. It seems possible that they moved to the house in 1877 and the evaluator did not come around for several months or a year. The next tax ledger shows a change at #10 Creagh Road where "Matthew" Langan replaced Pat Langan in 1890. Note: Pat had died in 1888 and it is highly likely that the change was made in 1888 or before with the property staying in Pat's name. Pat was actually listed as living on High Street in Ballinrobe at the time of his death. I cannot find any other indication of Pat, Mathias, or Bridget on High Street. The final address before leaving for America was also #10 Creagh Road. While Mathias's name was not crossed out, the year 1892 was entered. This was the year they left Ballinrobe for New York City. Pat Langan was in New York City by 1886. Martin, and Maggie immigrated to New York City circa 1890/91. Mathias, Penelope, James and Bridget immigrated to New York City in 1892. For more information on the Langan's immigration go to The Langans Immigration, now or at the bottom of the page. ancestry.com lists it under "Cagen"
*She had five children - all still living - although not with her. James was born April 14, 1877. Delia was born November 9, 1879. July 10, 1905 The death certificate listed: age at death, 57, married, housewife, born in Ireland, last address, 220 E. 18th Street, parents, James and Penelopa Nockton, cause of death, chronic nephritis. Buried Calvary Cemetery. Mathias Langan spent at least 19 years in New York City. For the Langan records from New York City go to Langans in New York City now or at the bottom of the page. Mathias Langan lived to be an old man. Mathias Langan went back to Ireland to be buried with his mother, Ballinrobe, Co. Mayo. Mathias Langan died in Ballinrobe. When Did Mathias Return to Ballinrobe? Unfortunately, there are no records available for return immigration that would indicate when Mathias returned to Ireland. The last record that I have found connected to him in the US was the death of Penelope in 1905. The 1910 census in NYC is not indexed making it very hard to find listings. He was not listed in the 1911 Irish census in either Ballinrobe or Mochara. Why Did Mathias Return to Ballinrobe? Who was still alive in Ballinrobe when he returned? I could not find his sister, Bridget Langan Feerick, in the 1911 census. His daughter-in-law, Ellen Houghan Langan, and his grand daughters, Martha and Helen, were listed in Ballinrobe in the 1911 census. Who was still alive in New York City when he left? His son, James, had died in NYC in 1915, leaving a wife and children. His son, Martin, had died in NYC in 1915; his wife and children had gone to Ireland circa 1904. His son, Pat, was still alive and living with his wife and children in NYC. His daughter, Maggie, was still alive and living with her husband and children in NYC. The Griffith tax ledger that covers the years from about 1915 to the 1930s contains a listing for Mathias Langan at No. 24 Creagh Road, Town of Ballinrobe. There were six changes at No. 24 between whenever this ledger startes until 1930. As near as I can determine, Mathias Langan replaced Honor (can't read surname) at No. 24 in 1916 and was himself replaced (by Margaret Joyce) in 1920. Mathias died in 1920 in the Ballinrobe Workhouse. Does the 1916 entry refer to the return of Mathias to Ballinrobe? Agnes Walsh Lahiff said he was an old man when he returned to Ireland. Two of his sons, Martin and James, died within weeks of each other in 1915 in NYC. The tobacco was most likely smoked in a clay pipe. Mathias Langan of Ballinrobe, widower, age 80, labourer, died on November 28, 1920 in the Ballinrobe hospital, cause of death, senile decay, 12 months, cardiac falure, two weeks, certified by T. S (can't read), Ballinrobe Workhouse. Mathias Langan was most frequently listed in the records as Mathias. He was listed as "Matthew" on his marriage record and on the tax records in Ireland. He was listed as "Matt" in the 1900 United States Census in New York City. He was listed as "Matt" on the List of Persons Receiving Tobacco from the Ballinrobe Workhouse in 1920-21. Langan is a name from the west of Ireland. "Langan "O Longain (probably for the adjective long, tall, not long, ship). As Langan, this name survives in Co. Mayo. " I am not sure what he is trying to say here. I do not know what the word ship has to do with anything. I am assuming that the name means "tall". However, several other sources give the meaning as "long". Who was that person or persons? Was it a family member, friend, neighbor? Who did the Langans know in New York?